Oooh, this is very good. I had to make it without the eggs, having run out, but it was excellent, excellent nonetheless. I used some Spanish olives stuffed with onions -- foofy, but oh so delicious. 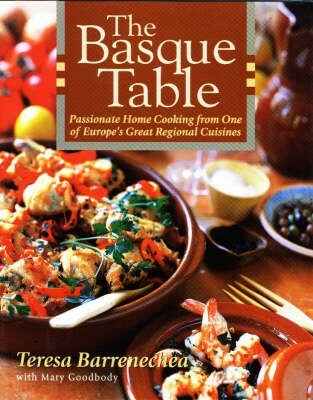 In Europe, the Basques are known for their creativity in the kitchen and their passionate, long-enduring culinary heritage. In the Spanish Basque country itself, food and eating are the center of everyday life and the focus of endless conversation. The 130 recipes in this outstanding new cookbook add up to an inspiring invitation to revel in the secrets of an undiscovered gem among the Continents cuisines. Teresa Barrenechea is the renowned chef-owner of two Basque restaurants in New York, both named Marichu. A native of Bilbao, Spain, she is an expert in Basque cuisine and Spanish cooking. Named after her mother, her restaurants are known to serve the most authentic Basque food in the United States.